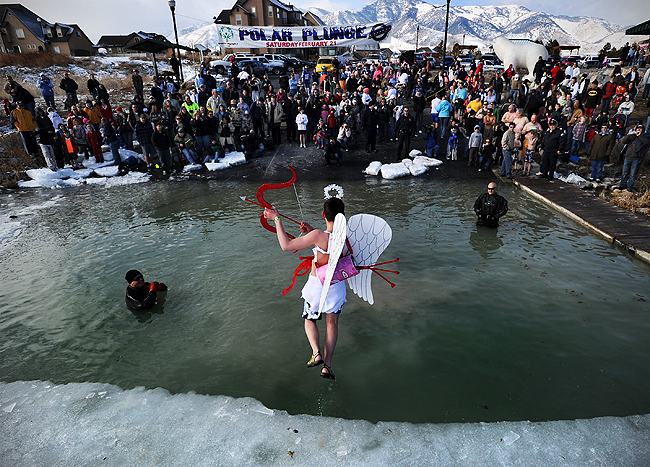 "In front of the crowd, Kyler Daybell of Salt Lake City leaps into the frigid water during the 2010 Polar Plunge at Pelican Marina in Saratoga Springs, Saturday, Feb.20, 2010. 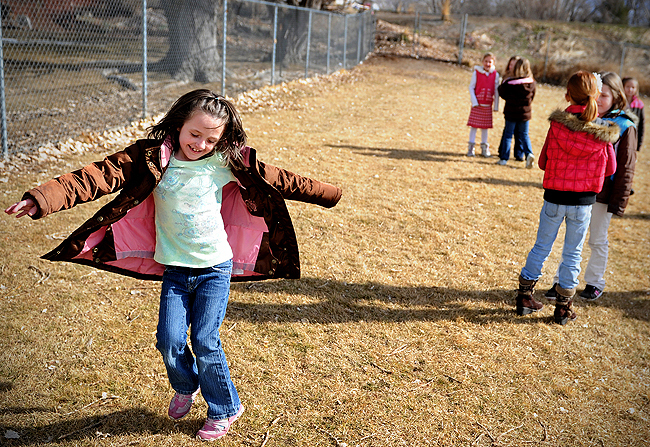 More than $4,500 was raised for Special Olympics Utah." This is my second time covering a polar plunge in two months and I was really debating whether or not to do it this time around. And despite being scared, yet saying I was still going to do it, I didn't. Last time it was cold. Really, really cold. I am talking single digits. This time however, it was about mid 20s, but yeah, still frigid. Speaking of seconds, this is the second time in a matter of months where I should have done something on my assignment that I've never done before, but backed out. I have the best job in the world, I get to meet new people every day. And with that, I get to experience something fresh, too. Not people have that luxury with their profession. A couple months ago I covered a new police dog. They demonstrated his attacking, take down skills with the huge bite suit. Afterward, they asked if anyone in the media wanted to try. I really wanted to, but backed out. And last week, I really wanted to try the polar plunge. But again, chickened out. So that's my new goal for the year. If I am on assignment and I am offered to try it (after shooting what I need of course), and there is a photographer there who will document it, I am trying it. 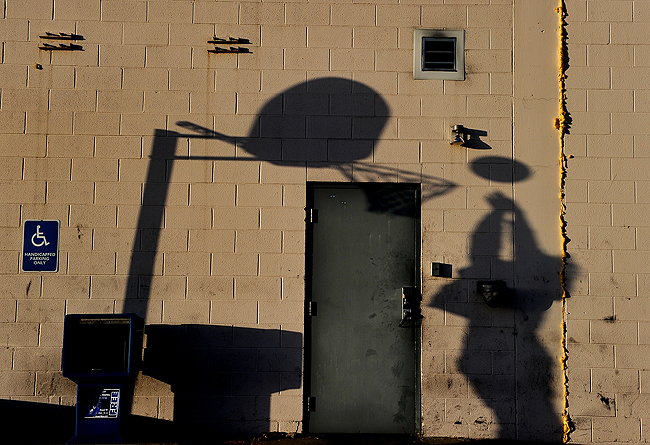 "Provo Daily photo intern, James Roh, shoots hoops between assignments in the paper's parking lot, Friday, Feb.12, 2010." Couldn't resist shooting pictures in the golden light last week. The intern, videographer and I all had about an hour of downtime between assignments and thought we'd take advantage of the uncharacteristically warm temperature. 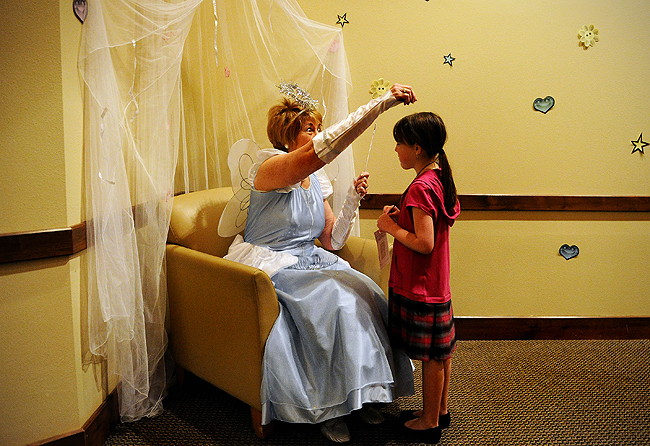 "Sue Hilliker, who plays the part of the "Fairy Godmother," sprinkles pixie-dust onto McKayla Smith, 7, during the Princess Festival in the Eagle Mountain City Council chambers at the library, Saturday, Feb.13, 2010." I'm back on the morning shift, which means Saturday morning assignments. To keep myself sane, I try not to venture out late on Friday nights with friends knowing I'll have to get drag myself out of bed super early. Last weekend was no exception. I was in my car heading southwest to Eagle Mountain way too early. I was in zombie mode. I feel like every time I head out there for a scheduled standalone event it's always canceled and I end up searching for another feature on my own. But this time around, the princess day festival at the local library was still on. Now to divert for a second, I told a friend to go out and shoot artsy photos of the east coast snow. They've been getting hammered...in case you live under a rock. Since they are not a photographer, they said no and explained: "I'd feel like a complete idiot standing in the middle of the road taking pictures. Someone would probably call the cops on me." I instantly laughed, telling them they'd never be a photojournalist if they worried about what others thought of them taking pictures. Case in point, being the only male in a room of 50 some little girls and their mothers at a princess festival, all while taking their pictures. Hahaha. Anyways, I hung around for about an hour, but it was one of my first photos I shot when I walked through the door that I liked the most. The "Fairy Godmother" had these big, creepy eyes, well, in my opinion. Good times. Only one more week and then I am back to the night shift! Woohoo! "With Utah Lake frozen over, a man walks his dog along a jetty at Pelican Marina in Saratoga Springs, Saturday, Feb.20, 2010." I had to shoot another polar plunge yesterday morning and did what I normally would do - show up early. With the plunge starting at 9 a.m., I thought I'd get there a half hour before the icy plunge. But it wasn't until I pulled into the parking lot with only a few people there that I knew something was wrong. I was told it started at 9 a.m., but the plunge didn't really begin until 10 a.m.
Great! So between sitting in my car to stay warm and shooting some random features, it was an early morning that I could have still been in bed. But I liked this frame, so I guess all is well. 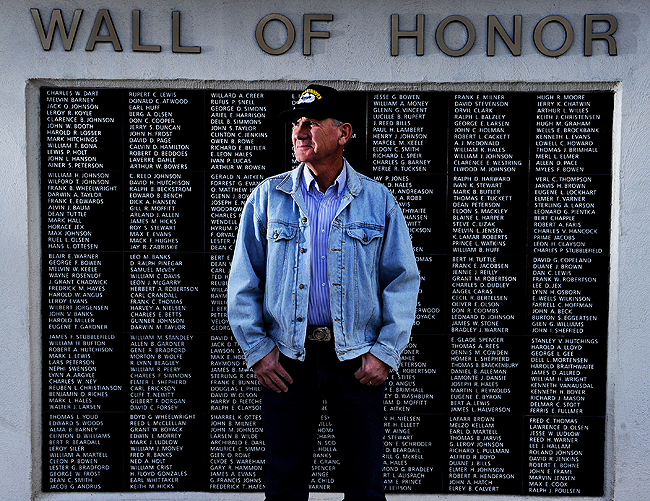 "Steve Wilson, an Army veteran and member of the Spanish Fork City Veterans Council, takes a moment to recall those on the veterans memorial wall he once remembered, but have since fallen, at the Spanish Fork cemetery, Thursday, Feb.11, 2010. 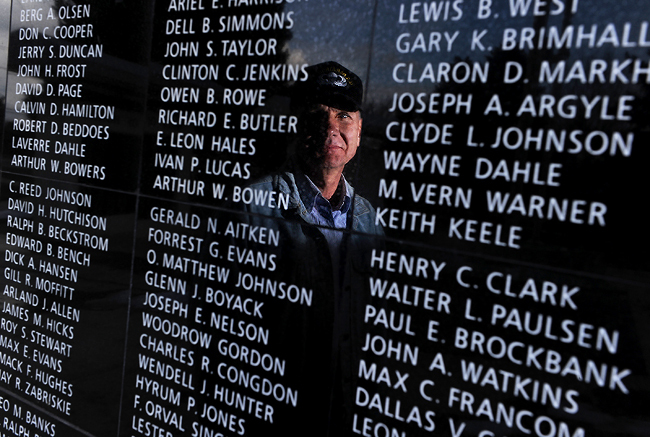 Wilson is securing a week with the traveling Vietnam Memorial replica and it will be in the Spanish Fork cemetery in the Fall. In addition, the cemetery just finished adding a $20,000 extension to their veterans memorial to put more names on it." I am very punctual. I hate being late and will often be early, too early a lot of the time. The other day I showed up the Spanish Fork cemetery and veterans memorial about 15 minutes before my assignment. It was bitterly cold, but I thought since it was a portrait I'd setup some lights and play around with ideas. As time passed, my subject was nowhere to be found. I gave him the benefit of the doubt and waited around. About 10 minutes past the original assignment time, the reporter showed up. As puzzled as I was, we hopped in his car to warm up. The reporter began to make some phone calls with no avail. After waiting 45 minutes, we called it quits and both ventured all the way back to the office. Later in the day, I got a call to head back down. It was a honest mistake that the subject had lost track of time and the day, but we still needed a portrait for the section front. So to keep things brief, I knocked out two quick portraits in a matter of 10 minutes, half of which was spent talking with my subject. I was sure my safe photo would run dominant, but I was wrong and happy to see my above photo big in print and online. 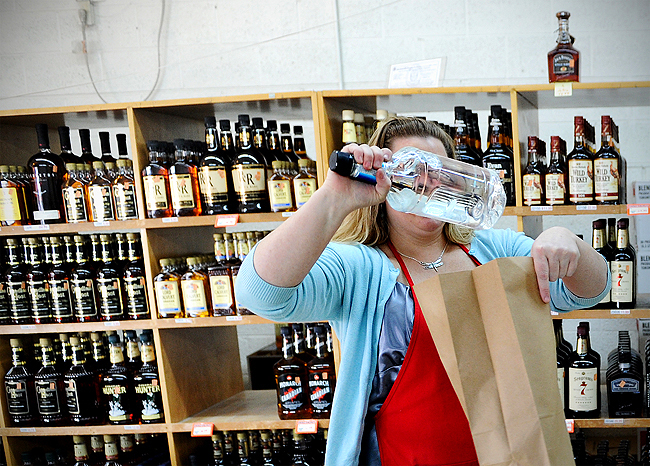 "An employee (who wished to remain anonymous) tends to a customer at American Fork's State Liquor Agency, Tuesday, Feb.2, 2010. The legislature may be closing the liquor store." Great image? No. Ironic? Yes. Had to shoot in a liquor store, in Utah County mind you (not many people drink alcohol here), where not one employee would allow me to photograph their face. Needless to say, it was an interesting hour hanging out in a liquor store where everyone was most likely one of the following: ashamed, terrified, embarrassed, or inebriated that they were either selling or were purchasing booze. Classic Utah County. Really is. "American Fork swimmer Tyler Cox streamlines in the men's 500 yd. freestyle in Heat Two during the 2010 UHSAA 5A State Swimming Championship at the Richards Building on the campus of BYU, Saturday, Feb.13, 2010. The American Fork men's team finished second overall behind Brighton." After spending a couple days shooting the state wrestling meet and being excited and overwhelmed trying to keep track of more than 1800 wrestlers, I was sent to the 5A swimming championship. Now, I've only shot one swimming meet before, it was outdoor, and that day was a bit crazy as it was my deadline to decide whether or not to accept my current job offer at the Provo Daily Herald. I took it if you haven't figured that out yet. Hahaha. I knew that my day would be hectic, as the heat sheet is more than 20 pages long and I'd be competing against some friends, other newspaper shooters. Needless to say, I was anxious. And having an assignment before and after wasn't making things anything easier on the mind. I was so nervous that I decided to nix the idea of bringing long glass, and boy was that a mistake. But as photojournalists do, I made it work with what I have. In addition, I finally made it the pervert window without anything troubles. Yeah, some BYU pool managers banned me from what they called the "pervert window" during a previous assignment...typical. Here is what I ended up with. 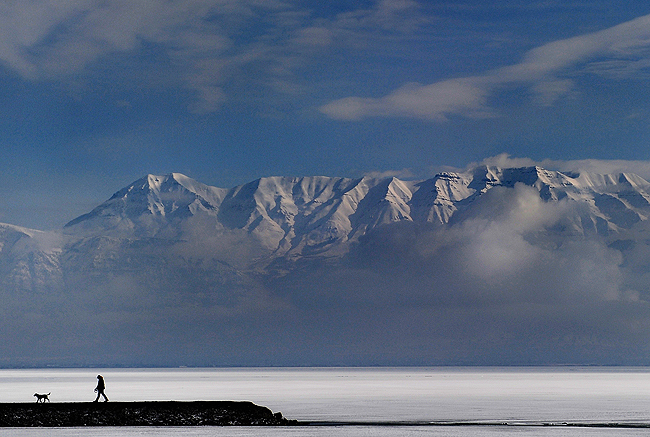 Check out what everyone else shot over on the Utah Photojournalism Blog. 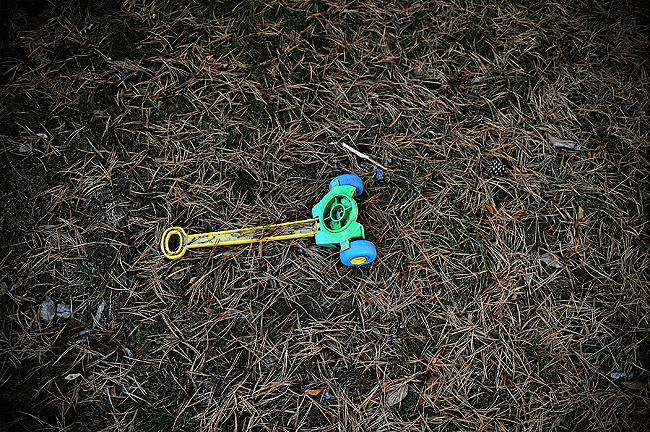 "A toy lawn mower rests broken in the yard as an Orem-based real estate investors club specialist shows off a home in Springville to a potential investor, Tuesday, Feb.9, 2010." I went on a real estate assignment and got to look at this crazy house. It was so odd for many reasons. For one, the toilets were all raised up off the floor. As in you needed to walk up two steps to get it, much like a king's thrown. Also, in the master bedroom, the jacuzzi like hot tub was surrounded by nothing, except carpet. Not sure whose smart idea it was to put carpet in a bathroom. Alas, we walked out back and the yard was a mess. I thought this was funny, because the entire house was a wreck, as if it was done up all wrong. So to see this broken toy in the ugly backyard, I thought, well this isn't going to work for you either. 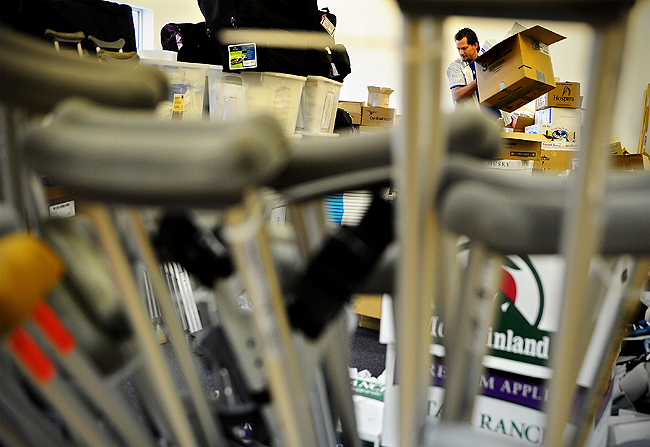 "Dave Beachem who works for Aspire, helps collect and sort medical supplies to take to Haiti at their Draper warehouse, Wednesday, Jan. 27, 2010. The Utah Hospital Task Force, who is operating under the umbrella of Healing Hands for Haiti, will be flying 160 doctors, nurses, construction workers, and more to Haiti." I don't really have much to say. I could say something like "this is as close as I'll ever get to Haiti" or "I wish I was there covering the local angle for Utah County" but I won't. In this case, I'll let Scott Strazzante and Chip Litherland say what I am thinking or have thought. They covered the issue and thoughts of a lot of photojournalists impeccably. What are you waiting for? Get over and read what they have to say, that is, if you haven't already done so. "UVU's Flint Ray crushes Boise State's Mark Bleuze into the mat in the 133-weight bout in the Shurian Family Activity Center at Utah Valley University, Friday, Feb. 5, 2010. UVU upset No. Boise State." Sometimes you should listen to you gut instinct. Other times you shouldn't. I don't know why, but I went for the latter the other night. 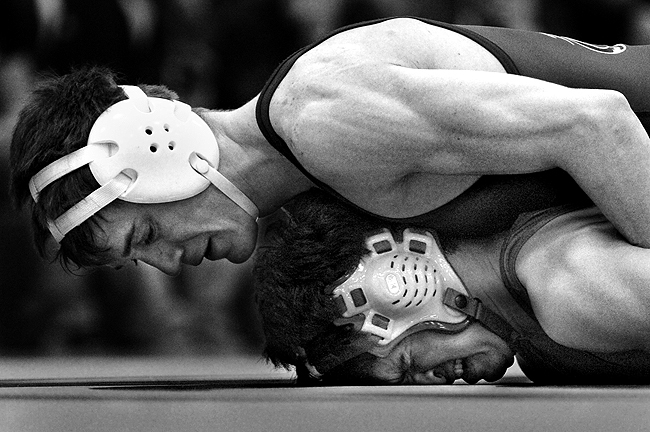 It wasn't anything major or even worth mentioning, but I should have brought in my 300mm to the wrestling match. The setup was pretty horrible, not really allowing photographers anywhere but to two corners of the mat. The sides were either blocked by fans sitting right on the mat, huge advertisements and media table or the two team benches. I've never seen a match so packed tight to the ring. Alas, making my far reaches of the corner a bit too far away for most of the matches. Don't get me wrong, I had fun, but being pinned away in a corner, with horrible lighting isn't my idea of fun. Next time I'll bring the 300. "BYU undergraduate Marcelo Gomez of Mikasa eyes up the goal before taking a shot against The Blue Team during a coed innertube water polo in the Richards Building on the campus of BYU, Thursday, Jan. 21, 2010." One would think finding a Monday Close-Up story would be easy, right? But when you're asked to pump out a second close up in the same month, then two other ideas, subjects cancel on you the week your story is due, it's time to fumble and rush to find something. Last year, when looking for stories, I found this unique sport over at BYU called innertube water polo. Brilliant. However, it wasn't being played until January. Luckily when I called over this month, they had a game Thursday night, and my story was due Friday. Talk about last minute! My first thought was, and I think Melissa Lyttle coined the phrase, "WWSD?" As in, "What would Sol do?" Sol is committed to traveling to the world to find the most unique and bizarre sports. This would have been perfect. Check him out at "The Wild Weird World of Sports." Anyways, besides all of the "rules" that I had to follow, and their strict enforcement, I cranked out video and stills in a little over an hour, and then went back Friday to do my interview of a player and piece it all together. 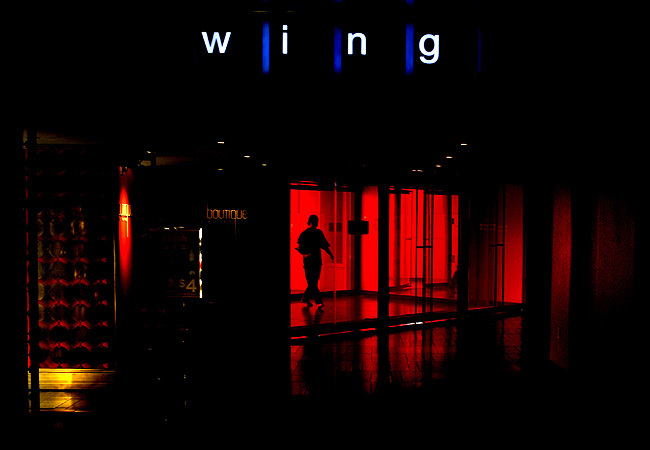 "A man walks through the red doors of the MGM Grand Hotel & Casino in Las Vegas, Saturday, Jan. 30, 2010." It's a sin I didn't take more pictures while in Sin City, a la, Las Vegas last weekend. I went down for a long weekend for the first time and enjoyed myself thoroughly. While I ventured around, and had my camera with me a majority of the time, I didn't take that many pictures. For what reason, I don't know? Maybe it was all the money in my head? Nah, doubt that. Whatever the case, I did walk away with a couple fun frames. But this trip, this time, I walked away with more memories than clicks on the camera. I think that's important sometimes. To see the world, unobstructed by a camera. 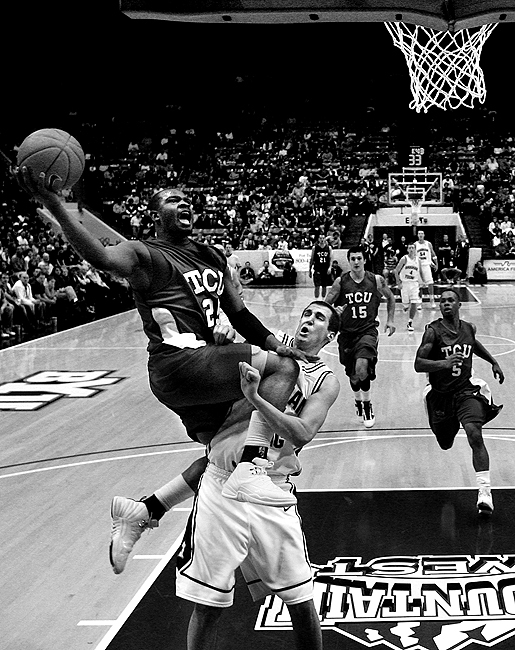 "TCU guard Greg Hill (25) launches over BYU forward Noah Hartsock (34) in the second half during an NCAA basketball game at the Marriott Center on BYU campus, Tuesday, Feb. 2, 2010, in Provo. BYU won, 76-56." There is only one remote that I can really get away with at BYU...and that's on the basketball post itself. Although, most nights I am rushing to get over there and don't have time to mount one, I thought I set one up the last night. With remotes, things go wrong and they shouldn't be relied on, but they do provide a nice angle that's fresh. And when the sports desk tells you how much they love it, it must be good, right? After setting up and getting the OK, I went back to the media room to eat some free grub (I am never there on pizza night!) and ready my computer for the game. I walked out and sat on the court when I started having a mini panic attack. What was bugging me though? The battery was fully charged, it was safely mounted, I had all the right safety cables, and the focus was checked multiple times. But I wasn't sure if I ever put a card in the camera. I spent the entire first half firing the remote not knowing if I was even getting anything. After the first half buzzer, I jumped up and had a sigh of relief - there had been a formatted card in the camera. The only problem was that I had it set on low continuous shutter release, so I was only getting about four frames a second, rather than eight frames a second. In the end, I got a couple usable frames and moved them, but then again, I kept forgetting I had a remote up most of the game. Hahaha. Not to mention, I am super spoiled. 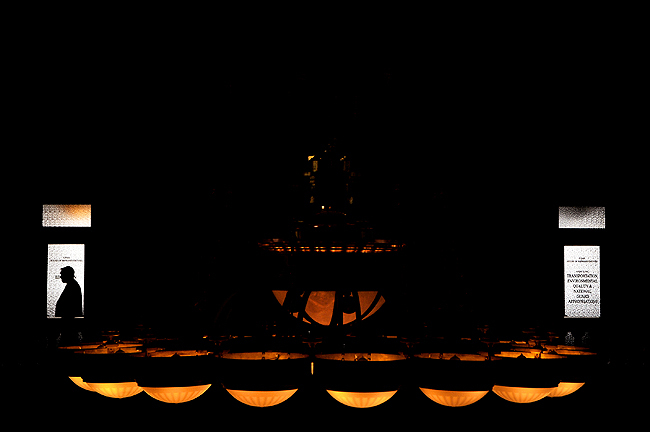 My Nikon gear looks amazing at high ISO. So my company issued Canon 1D Mark II N is a night and day difference to my Nikon D3S. 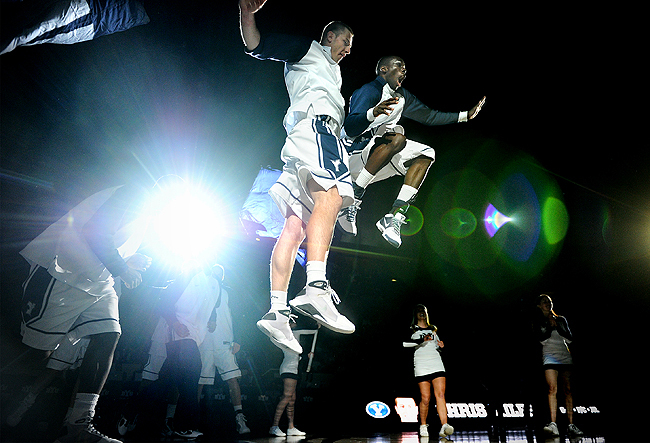 "In the spotlight, BYU's Chris Miles and Lamont Morgan, Jr. are introduced before taking on Eastern New Mexico during an NCAA basketball game at the Marriott Center on BYU campus, Tuesday, Jan. 2, 2010, in Provo, Utah. BYU won, 95-49." Being a stones throw away from the campus of BYU it would be almost silly for us not to cover every home game of the big sports. With that, I've shot a handful of BYU men's and women's basketball games this winter (can I say winter yet, Utah? Or does it get worse?). Each men's game I always shoot the pregame intro. It's pretty standard. They crank Justice, let the cheerleaders clap their hands and announce the players name in an exaggerated tone. You know what I am talking about: "Tylllllllllleeeeeeerrrr Hawwwwwwwwwssss...."
But every game there I am, laying on the floor, being told not to do that by the BYU cheerleaders, as I shoot the introductions. I've finally found a good spot where the last player and "chest bump" makes for some pretty epic light. The other night (I totally forgot to post this!) I got one I finally liked the most...so far. Until next game, I'll like this one the best.